Tori Sampson sets her exhilarating fable If Pretty Hurts Ugly Must Be a Muhfucka in what the program calls Affreakah-Amirrrorikah, a magical place that seems to be part Nigerian village, part American bedroom. There’s a god-filled river and access to a supernatural realm, but there’s also a lot of Brandy on the soundtrack. Where are we? When a girl finally looks into a mirror in the final scene, we belatedly recognize that we’ve been beyond the Looking Glass all along: Our white rabbit–ish guide was the human-sized cell phone (Rotimi Agbabiaka in a sparkling suit), and our Alice was innocent Akim (Níkẹ Uche Kadri), whose enemies were queen bees—the mean girls at her West African high school who hate her for her perfection. Beauty isn’t in the eye of the beholder here. It’s an accepted, incontrovertible truth that Akim is without blemish or fault, which is why vengeful Massassi (Antoinette Crowe-Legacy), sweet Adama (Mirirai Sithole) and brilliant Kaya (Phumzile Sitole) are goaded into violence: They can’t bear life in the shade. Gorgeousness hasn’t been a picnic for Akim either, though, since her parents (Maechi Aharanwa and Jason Bowen) keep her close and sheltered, apart and different, alone and longing. Akim’s romance with Kasim (Leland Fowler), also called “the boy who sees,” is supposed to be a comfort, but it’s only another source of pain. He can see the future, but can he get beyond his own dazzlement to see the inner Akim? Sampson’s script plays like it’s sledding on a steep hill: You can feel the speed, the writer’s whizzing wit, the swift adjustments in tone and direction. The mixture of folklore-speak and hilarious up-to-the-minute banter is intoxicating, but it’s also a clever comic strategy to smuggle the girls’ pain past our watchful minds. Akim cries out, “God of earth, god of wind, god of fire, god of the Obamas! Please take my beauty away from me!” and our laughter means that her suffering catches us a beat later, by surprise. Leah C. Gardiner’s vivid production at Playwrights Horizons is notable for its balance and propulsion. The cast is excellent: Kadri, Crowe-Legacy, Sithole and Sitole each make star-making turns, shining with uniform brightness in a collaborative constellation. 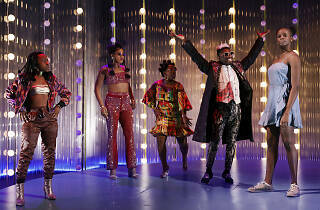 The music (by Ian Scot) and choreography (by Raja Feather Kelly) are superb, and the costumes (by Dede Ayite) are like characters themselves, with little journeys and heartbreaks of their own. 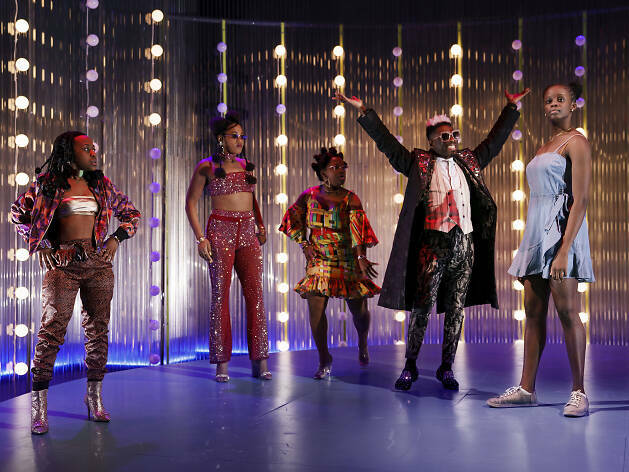 During one impressive section, the Voice of the River (Carla R. Stewart) begins to sing, the cast dances out into the audience and the two percussionists (Rona Siddiqui and Erikka Walsh) go frantic. It’s a measure of Sampson’s strength that she can wrest control back from such a giddy sequence—that she can crack her play open for a cataract of musical ecstasy and not have her text seem dry in comparison. Still, when the show is over, it’s hard to shake that feeling of having been tumbled around by a torrent. If Pretty Hurts is both exciting and crushing; it contains a sense of danger. That’s the combined effect of the music, the production and Sampson’s play: It's the feeling of being barraged by talent, all of it at full flood. Playwrights Horizons (Off Broadway). By Tori Sampson. Directed by Leah C. Gardiner. With ensemble cast. Running time: 1hr 30mins. No intermission.